Over the weekend, Michael and I headed to Nashville for a little roadtrip fun! We did all of the typical tourist things… checked out the Country Music Hall of Fame, the capitol building, listened to live music on Broadway. But we also added some “out of the box” fun as well.. such as having a picnic at the beautiful Arrington Vineyard and going golfing! I don’t know about you guys, but I always get a little worried before I go on trips. Will I have enough to eat? Will I get glutened? Will I find any restaurants to eat at? Did I pack enough snacks to tide me over? This vacation was no different. I packed a ton of snacks for our car ride that also lasted us over the weekend. I might be the only girl to ever bring avocados along on a road trip and I’m not ashamed! My favorite part of the weekend was our picnic that we had at Arrington Vineyard. It was peaceful and so relaxing. Michael tried some of the wines and I just ate loads and loads of guacamole! The best part was that we were able to get all of the foods from a local grocery store, The Turnip Truck, which had a GREAT selection of gluten-free foods. So I felt at ease at least for that meal knowing I wasn’t going to get glutened or suffer from cross contamination. As our last meal of our trip, we decided to hit up a restaurant along Broadway called Merchants. I hadn’t gotten sick the entire weekend and I wanted to keep it that way so more upscale restaurants that serve steak are normally my go-to in that case. This restaurant was seriously sooo good! Michael and I both got steak and while he opted for the duck fat fries with gravy as his side, the chef was able to put together some sauteed vegetables for me not on the menu since I was not able to eat any of the other sides. However, while scanning the list of sides I saw creamy mashed potatoes listed. Since then, all I’ve been wanting is mashed potatoes. Creamy, dreamy mashed potatoes. Enter cauliflower parsnip mash stage left. When I get a craving, it doesn’t seem to go away until I make it. While I wasn’t really feeling mashed potatoes were the best choice for me after a weekend away and not eating as healthy as I normally do, cauliflower parsnip mash definitely fit the bill. While this mash will not completely fool every potato lover out there, it definitely will satisfy a hankering for the real thing. This mash was light and fluffy and perfect served with our roasted chicken thighs! I loved the flavor that the chives added to the mash but you can easily swap it for another herb as well! If you’re looking for a lighter side than the normal mashed potato, look no further! I personally can’t wait to make these again this fall! 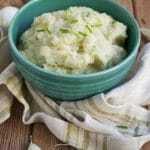 Cauliflower parsnip mash is very reminiscent of mashed potatoes. Creamy, flavorful and filling. Try it as a side for your next dinner. Gluten-free, dairy-free and vegan. Bring a medium pot of water to a boil. Once boiling, add parsnips. Continue to cook for about 5 minutes and then add the cauliflower. Cook for another 5 minutes, until parsnips and cauliflower are soft and able to stab a fork trough them. Drain water. In the meantime, heat olive oil in a skillet over medium heat. Add minced garlic and cook for 1-2 minutes, until fragrant and lightly browned. Make sure to stir continually so the garlic does not burn. Add hot parsnips, cauliflower, and garlic to a food processor or Vitamix. Blend until combined. Add 1/4 cup to 1/2 cup chicken broth until you reach the desired consistency. Place in a bowl and stir in salt, pepper and chives. This looks so delicious! I am obsessed with cauliflower. I just made a cheesy cauliflower soup last week. I am bookmarking your recipe. Thanks Tia! That cheesy cauliflower soup also sounds amazinggg!!! DEFINITELY trying this. I like cauliflower mash but it’s kind of like ‘meh’ to me. But I LOVE parsnips. They add such a nice sweet kick. Great inspiration here! This is just what I’ve been needing, more low carb recipes. And cauliflower parsnip…. YUM! This looks so amazing. I <3 cauliflower but am never sure what exactly to do with it other than eating it raw haha I must try this! I LOVE that you take avocados along on roadtrips, too! Best snack ever 🙂 I’m loving the idea of adding parsnips to the cauliflower mash. So smart! I’m going to have to try this one out soon!! This looks delicious. I will have to give it a go. I cooked cauliflower and partsnips – half and half, then mashed them together with some table cream and a nob of butter, THEN added a little more butter and salt & pepper to a serving. DELICIOUS! !